Last month I kicked off a new "feature", where I demonstrate some basic element of cooking. Last month was my fool-proof way to caramelize onions. This month's How-To was all set, until my computer decided to devour my pictures. In my opinion, a "how-to" would be pretty pointless without pictures of the process so I will re-do it and post that for next month. However, recently something funny happened. Well I found it funny, and I thought I would share it with all of you since it is cooking related. Me: Brent... it's not broiling. B: What do you mean? Is the oven on? Me: Yes. There is no heating elements up at the top... its all below. B: Huh. 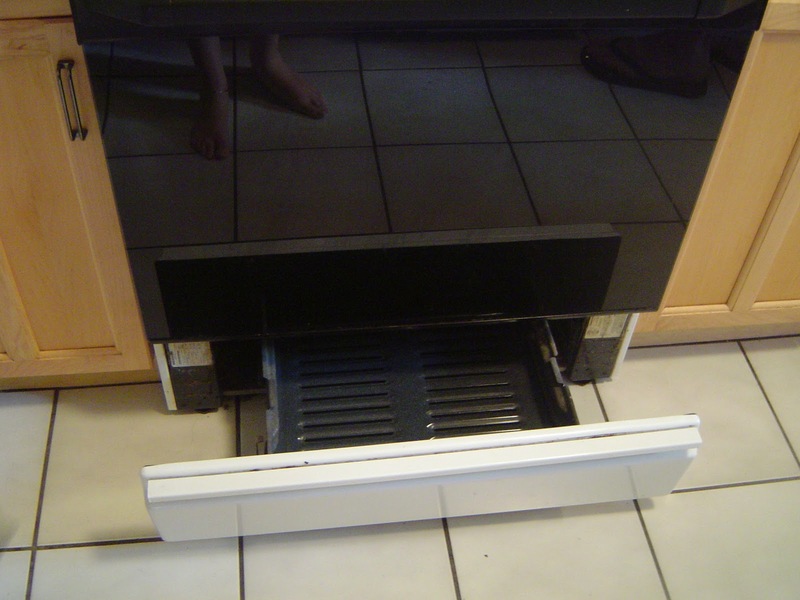 You're right, there is only heat/fire under the oven where that drawer is. That's odd. Me: Is it broken? How are we going to get gooey cheese on things if we can't broil? How am I going to be able to brown casseroles if I need too? B: I don't know baby... I've never had one before. Me: Well we are going to have to call [landlord's name] because this isn't going to work. I need to be able to broil. B: I'll take a look at it later. It'll be ok.
Me: OK... I'll finish this in the toaster oven. At this point let me clarify something. 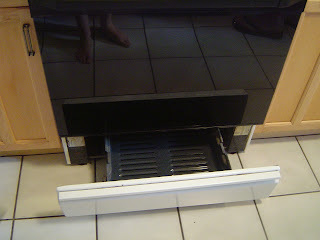 With an electric stove, there is a storage draw underneath that most people use to store pans or baking sheets.When we moved Brent asked why the baking sheets weren't under there like at the last house. My response was because it's too small and the "fire" is right there. Do you see where this is going yet? Use the drawer under the oven. Please tell me something like this has happened to some of you. When I moved in with the guy who's now my husband, I couldn't understand why the silly man was keeping the roasting pans in the broiler. Twenty years later, I still miss my gas stove. THank you for this post. Because this morning I was browning my cream brulee with sugar. I put my on the top of the gas oven and it only bake the egg part not the sugar. Now i know why!!! Yay! Very interesting. I was confounded with this as well after only cooking with electric stoves most of my life. Also just learned that the gas stove in my new apartment has a broiler built in at the top as well as the bottom! Thanks for the interesting post. I tried to use my gas broiler as a storage drawer, but put a glass frying pan lid in it, when I went to use the lid later it was completely shattered from the heat. And I still haven't figured out how to use the broiler. Thank goodness for the toaster oven. Meatloaf: Love it or Hate it? Crab, Artichokes, and Cheese! Oh My!